I hope everyone had an excellent weekend. I had quite the awesome baseball filled weekend! Don’t you wish you got a spring break? I’d go somewhere warm & sandy. 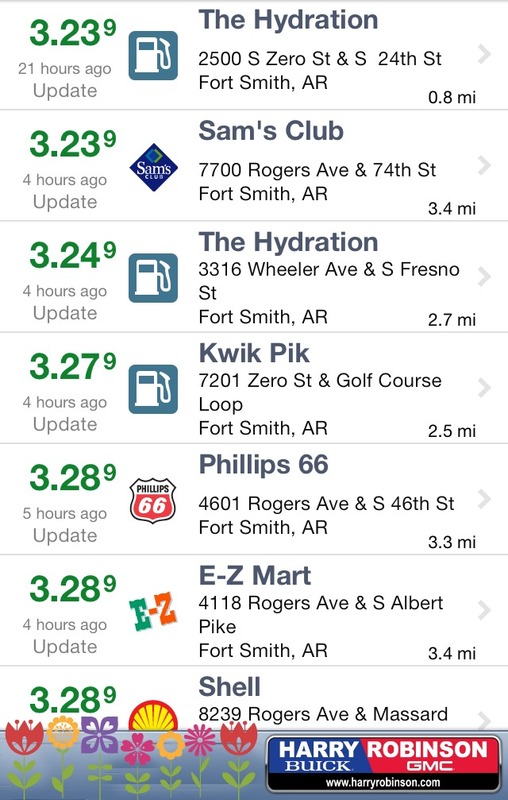 For those of us not on vacation & still here in Fort Smith going through a semi-regular week, here are the best gas prices around town today. We go out looking for a Free Gas Friday winner, every Friday. All you have to do to win a $50 free gas card is to be out and about in Fort Smith on Friday and have bought your vehicle from Harry Robinson Buick GMC! We will know you bought from us because we look for the Harry Robinson logo sticker on the back of your vehicle or the Harry Robinson license plate on the front of your vehicle. So, if you buy from us you qualify. We choose randomly, and by randomly I mean we give it to the first person we see when we start looking on Friday! It doesn’t get more random than that! Oh, While you’re thinking about it, ( 😉 ) will you like us on facebook? If you have any questions about the car shopping or buying process please let me know. I’d be happy to help you in any way possible. My email is cathyn@harryrobinson.com, or you can leave a question in the comment section below. If you’re ready to schedule a test drive or have a question about any of our Buick, GMC, or used inventory please call or text Jackie 479-522-4594 or email jackiem@harryrobinson.com.